NAPLES, Italy (NNS) -- The George H.W. Bush Carrier Strike Group (GHWBCSG) commenced strike missions in support of Operation Inherent Resolve (OIR) from the eastern Mediterranean Sea, Feb. 13. Carrier strike groups demonstrate the mobility, flexibility and power projection capability of the Navy's globally-deployed force -- anytime, anywhere. The GHWBCSG operations in the eastern Mediterranean Sea in support of OIR demonstrate the capability of the U.S. Navy to conduct precision strikes on Islamic State of Iraq and the Levant (ISIL) targets from multiple theaters, highlighting the flexibility of the Navy's globally-deployed force. The George H.W. Bush Carrier Strike Group entered the Mediterranean Sea Feb. 2, and will continue to provide support to allies and partners, deter potential threats and conduct strikes against ISIL operators and infrastructure in support of OIR. The GHWBCSG consists of flagship aircraft carrier USS George H.W. Bush (CVN 77) with embarked staffs of CSG-2, Carrier Air Wing (CVW) 8 and Destroyer Squadron (DESRON) 22 and the squadrons of CVW-8; guided-missile cruisers USS Philippine Sea (CG 58) and USS Hue City (CG 66); and DESRON-22 guided-missile destroyers USS Laboon (DDG 58) and USS Truxtun (DDG 103). 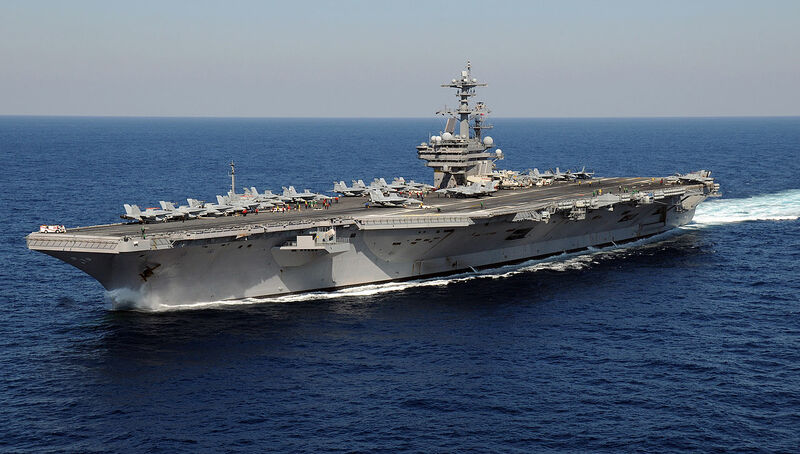 The most recent aircraft carrier strike group to operate in the U.S. 6th Fleet area of operations was the Dwight D. Eisenhower Carrier Strike Group (Ike CSG). The Ike CSG conducted strikes in from the eastern Mediterranean Sea in support of OIR June 28-July 7, 2016, and Dec. 6-12, 2016, completing 1,899 sorties in support of OIR. Operation Inherent Resolve is the unwavering resolve and deep commitment of the U.S. and partner nations in the region and around the globe to eliminate the terrorist group ISIL and the threat they pose to the region and the wider international community. U.S. 6th Fleet, headquartered in Naples, Italy, conducts the full spectrum of joint and naval operations, often in concert with allied, joint and interagency partners in order to advance U.S. national interests and security and stability in Europe and Africa. Note: In the top U.S. Navy photo an F/A-18F Super Hornet launches from the deck of the USS George H.W. Bush. The other U.S. Navy photo shows the Bush at underway at sea.